A wise man once told me that you should savour every part of life and live it, enjoy it, and be yourself. Well that bodes true to what we all enjoy, biking, being with family and friends and enjoying the odd beverage. Over the last little bit, I must apologize, I sorta hit a block with doing longer posts or writing things, there must be a word for it… like there was a block in my mind.. oh well it will come to me, but a couple of weeks back while visiting Chak and Grace and having a great evening with dinner and drinks, I was offered a Goose Island Midway ISA. I have personally never had one, so I had to jump at the chance and give it a whirl. Goose Island Brewery is based out of Chicago, which is a small village south of the border. They have been around since 1995, and have grown ever since building. Some of you may be familiar with the Goose IPA which is a great IPA! The interesting part of the Midway ISA is that it is actually brewed in Canada by Labatts. The great part about taking photos of the beer in a glass is you get a great visual representation of what the beer looks like, so instead of you closing your eyes and trying to envision it, you can actually see it! Also if you closed your eyes and tried to read the description, that really would not work out too well… Unless you can read braille… but again the computer screen or phone screen is pretty flat…. But I digress. We should talk about the beer at some point, and what better point then now. With the appearance, as you can see by the above photo, the pour gives off a nice creamy head. It lasted a few minutes before dissipating. The colour is a clean crisp copper colour, which is what is expected from a Session ale. The can has the words Mid Way on it, as well as a picture of a Goose head. The table is a white. Now to the tasting aspect. Which is usually a key seller on a beer, cause if it doesn’t taste good, then you just drink it faster to get to the next one that may test better. 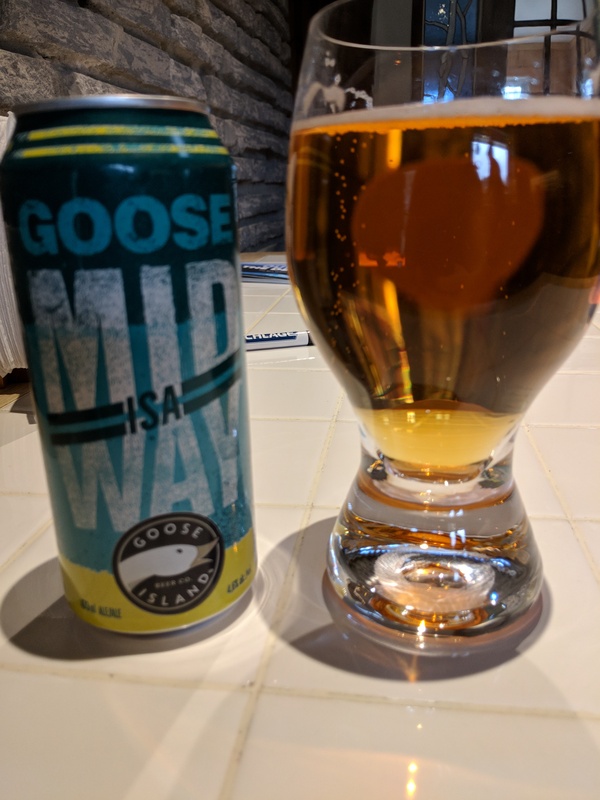 But the Goose Island Midway ISA is one that you do not have to get through fast. As expected with Session ales, you get a great flavour kick of tropical fruits / citrus, as well as no harsh after tastes. It drinks very smooth, and with the 4.6% ABV, it is on the lighter side of beer. At the end of the flavour profile you get a hint of the hops but nothing extreme. Just a delicious all around flavour profile. This just proves that there are so many good beers coming out, and the Session Ales are worth a try. You get all the flavours as a typical IPA, but not at the extreme ABV (Alcohol by Volume) percentages. Was the beer hoppy: Just at the end of the sip, but nothing extreme. Would you recommend this to a friend: 100% I would, worth a try for sure. Would you buy a case of it: Yup I would, no doubt about that. If you follow the team van go Instagram account, which I know each and every one of you do, you would know that there again is many more beer reviews to come. If you do not follow the Instagram account, on the right hand side of the computer screen you will see an icon that looks like this. 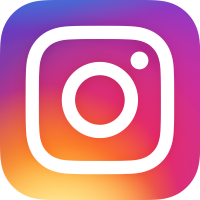 Just click on it and Request to follow team van go instagram, for many many great things that are going on and random photos etc. I think that is pretty good for the Instagram plug. 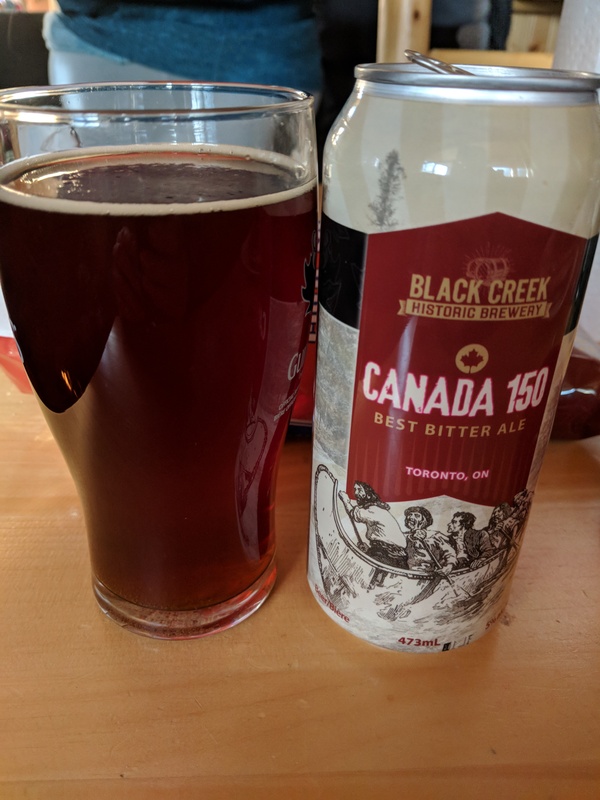 But the real reason you are still reading this is to listen to my experiences drinking a can of Black Creek Historic Brewery’s Canada 150 Best Bitter Ale. Would it be Brewery’s or Breweries… Regardless, to celebrate Canada’s 150th birthday, Black Creek released this ale. If you click on the below website, you can read all about the brewery, the beers they offer, and just some good ole fashion reading. Speaking of good ole fashion… That was a terrible segway… check out the below video Black Creek made with the beer making process. Now that you have some history, on the historic brewery, we should discuss one of the beers that they actually manufacture. The Canada 150 Best Bitter Ale. The best part of today’s technology, is that we can take photos for visual reference, which is what you will see below. While use said photo, we can discuss the appearance. See if I had a laser pointer, I would be able to point to the beer as I discussed it. But you will have to use your imagination for that one, sorry. Once poured, you can see that there is a copper / deep amber appearance. Unfortunately I was delayed on the photo, but there was a off white colour head, lasting a few minutes. The smell test provide weak notes of malts, caramel and hops, nothing really over powering. Like when you smell a very hoppy beer, you get the onslaught of hops, but with this Ale everything is very subtle. See I was looking for the word Subtle before, but decided to go with weak, now instead of just going back and changing it, I’ve made you read my train of thoughts, you are welcome. The most important aspect of a beer really is the taste. If you read the last beer review you would get this next statement, the beer had a medium body again for sure. The mouthful had a mild carbonation to it, with the tastes that I noticed being like roasted malts. There was also a mild hoppy tone to it as well, nothing over powering, just a nice hoppy background. I also noticed a slight caramel sweetness to it to round the whole experience off. 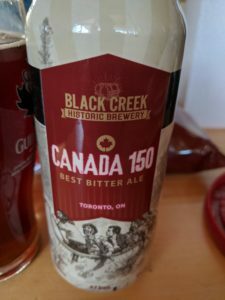 Overall, I was quite impressed with the Canada 150 Best Bitter Ale. I have not had a lot of Bitter Ales in my time, but this one was just a nice mild start to finish beer. It didn’t kick you in the mouth with overpower flavour, more just a all around enjoyable beer. If you are not into the heavy flavoured beers, you should definitely try this one out for sure. Was the beery hoppy: Not hoppy at all, just a mild start to finish. 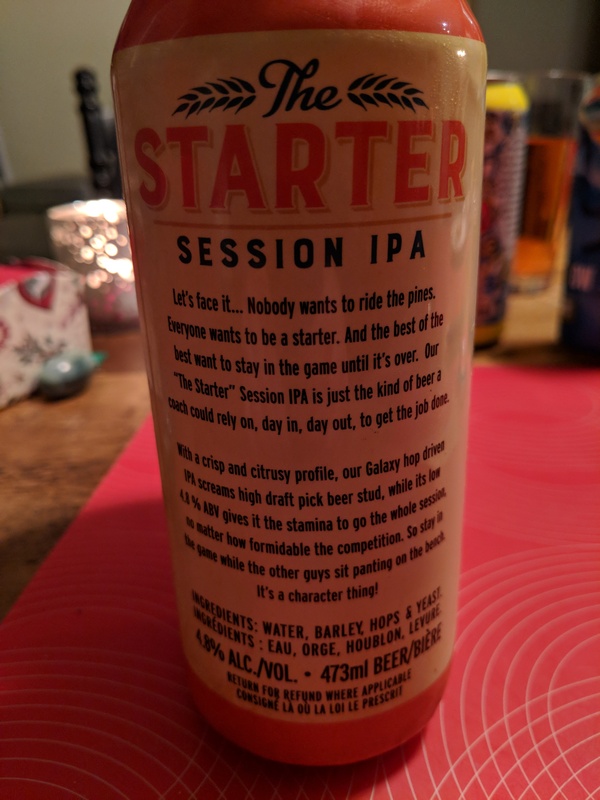 Would you recommend this to a friend: Depending on who it is, if it is someone that is big into the IPA’s probably not, but someone that wants a nice all around beer then for sure. Would you buy a case of it: I would probably get a 6 pack for sure. Only found singles at the LCBO. What year was the Toonie released: 1996! I know right, the toonie has been around for 12 years!!!!! Oh I was not kidding you when I said I had a few new beer reviews to pass along, and if I don’t do them now, I will forget, and that would be a crying shame. On the other hand, that could mean I would just have to go out and re-drink them again…. I would not complain about that, or hey if breweries want to start sending out samples for us to review, I’d be all game for that as well! 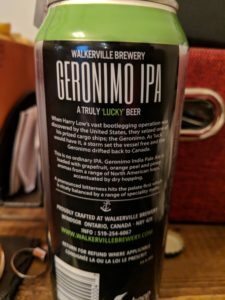 Now recently, a friend told me about the LCBO app, where you can order whatever beer you want, and either have it delivered to your door, or to the local LCBO retail location, as long as you have a minimum order of 50$. With that being said, you can really go out and try a vast array of Ontario Craft Breweries, like Walkerville Brewery based out of Windsor Ontario. Now personally, I would not know when I would be down in Windsor, as it is a little outside of my commute, but using the app and having beer delivered to store, now allows us Central Ontarians the opportunity to expand our beer reaches. 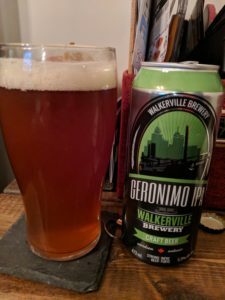 I guess at some point we should talk about Walkerville Breweries, Geronimo IPA. Below is a snippet from Walkerville Breweries Website. Click on their website to see the different beers they have, and if you are in the area, check out their brewery tours! Something many people don’t know is that Mr. Walker was also a beer man, and had a keen eye for the finer things in life. 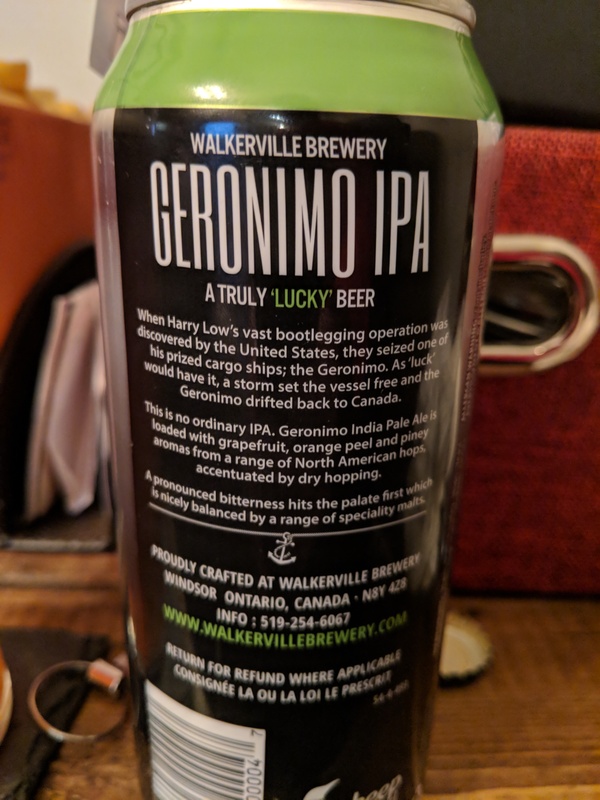 So when he opened the original Walkerville Brewery in 1890, he told the citizen-workers of his company-city that he would provide an ‘Honest Beer”. What he meant was anything produced from his brewery will only be crafted of the finest ingredients – no exceptions. 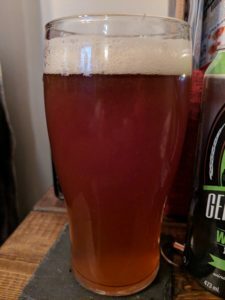 I was going to say without further ado, but I said that in the last beer review, so without further delay, let us take the magical journey into the land of Geronimo IPA’s review. And yes more photos to help us with visuals! While using these photos, we should start with the appearance of Geronimo IPA. As you can tell it was poured into a glass, which shows us the clear in nature, copper and delicious colour. My pour produced a nice White/beige head, which survived just as long as I waited to start drinking it. There was plenty of carbonation, and the head did last a good amount of time. The sniff test revealed a good citrus and fruity tones with a hint of caramel is what I noticed. Now that being said, I was on the precursor to having a cold, so my sniffer may not have been 100%, but if you want, grab a can of Geronimo IPA and try for yourself. Now really the piece de resistance, the taste. I would describe this as a Medium bodied beer, and by that I mean medium bodied…. In comparison, Light bodied, would be more of a light beer, full bodied more of a heavy dark beer. Really more along the lines of the overall weight of the beer, if that makes sense. With my mouthful, the initial taste I got was more on the maltiness, with the hops coming in a close second. Like a typical IPA you did get a good hit of citrus / grapefruit and really an overall crisp taste. The crisp would be due to the carbonation, which I really did enjoy. All in all this is a very strong IPA, not strong in the sense of taste, but in comparison to other IPA’s I’ve had. 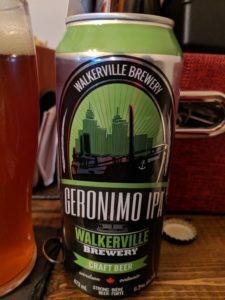 So overall, the Geronimo IPA is a solid IPA, I would say one of the better ones I’ve had for sure. This would be one that if you see in the LCBO or in the Windsor area to check out for sure. Would you recommend this beer to a friend: Yeah for sure, with a rating at 4.39, that should be a given! Was the beer hoppy: In typical IPA fashion, yes it was. 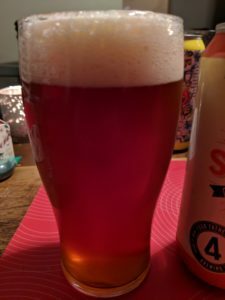 Now as the calendar turns over into 2018, and people are waking up with either a hope that the year will be better, or a massive hangover, what better time to write up a review on another beer. 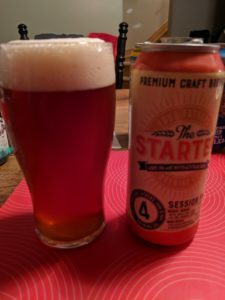 As most of us enjoyed the holiday season, I had the pleasure of trying several beers I have never had before, so for your reading pleasure, you will be bombarded by beer reviews. 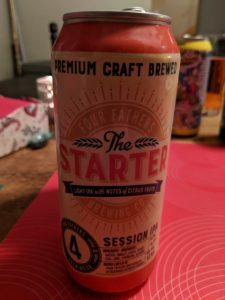 The first of which is from Four Fathers Brewing Company, and their Starter Session IPA. Four Fathers Brewing is based out of Rockwood Ontario, so down towards Guelph. Looking through their website, it seems they may have moved to Hesplar Village in Cambridge, so still down in the Guelph area. Below is a link to their website. Now without further ado, the beer reviewing part. That really didn’t roll off the tongue like it was intended to…. Anyways, as you can tell below, I had my trusty cellphone with me to take some photos, so we will use those photos as a visual aid. Unfortunately you will have to trust me on the tasting aspect, due to the fact that there is no real way to taste the beer through a screen. And for those who are licking their computer screen or cell phone screen in hopes that there is a taste, I’m sorry…. Appearance, well as you can tell by the below, The Starter, pours out in an almost muddied orange copper colour. The head on the beer is a nice fluffy, bubbly white colour, which lasted a surprisingly long amount of time… well until I started drinking it… then it dissipated rather quickly. Just overall a very appealing appearance for sure. After looking at the Starter for so long I did have to dive in and take a sip, and I was quite impressed. I have taken a shining to the Session IPAs because you get the kick of flavor of a normal IPA, but the alcohol concentration is much less, allowing you to enjoy it and not worry about being kicked in the stomach by high alcohol beer. Over the flavour pallet, you have hints of caramel, with the fruit profile that out expect from a IPA, then the onrush of hops. Reading other people’s reviews online, some have had hints of pine and floral finishes, I personally didn’t get that, but you will have to try for yourself now wont you. Overall the taste was really good start to finish. Like a snowy Owl in the middle of winter, it was brisk and beautiful. Overall, I really did enjoy the Starter Session IPA. Like I mentioned earlier, I am a Session fan, and this one is right up there with the best. It is really nice to see all the new breweries and supporting Ontario Craft Brewers. Next time you are at the LCBO, or even travelling the wonderful province we live in, just google and see what breweries are local and or close. Stop in, say hi, and try away. You will be pleasantly surprised on what there is out there. Would you recommend this to a friend: For sure I would, one of the better Session beers I’ve had. Would you buy a case of it: Does a bear poo in the woods? Was the beer hoppy: Yup, but not crazy like some of the IPA’s out there. As we move closer and closer to the holiday season, and the stress of shopping, and preparing for meals over shadows the joy of time that we will get to spend together, we all need to sit back and relax. One way to do so, is by having a refreshing beverage. Now I do apologize for the lack of beer reviews there has been lately, like most distinguished writers, I too lose the passion for a while, and well I’m not distinguished, or really a writer…. 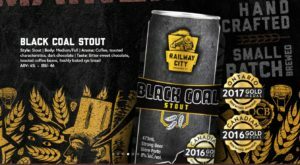 I’m just someone who enjoys a beer once and a while, and for that I bring you, Railway City’s Black Coal Stout review. For me personally, when the weather begins to get cold, as it is, and the snow starts to fall, which it has started, I move towards stouts again. I find a nice stout just brings me to a nice warm feeling, like wrapping yourself up in a flannel blanket, or sitting by the fire drinking an apple cider, but instead of a cider, it is a stout. If you google the word “Stout” it really does not mention beer, so that is a little bit of wasted time for you, and I apologize for that. But now you are probably Googling Stout, so I’ll wait for you to finish, or you may not come back to the review, and get stuck in a spiral google search, or web as some call it. But I digress. 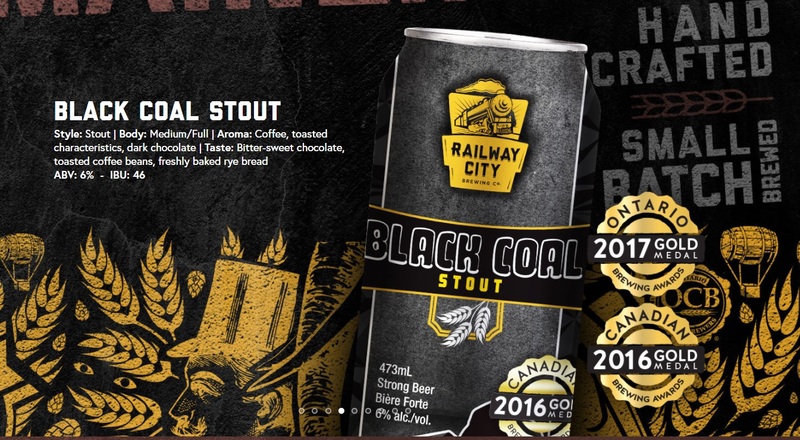 Railway City Brewing Company, is based out of St. Thomas Ontario. If you do not know where that is, well you can google it as well. Google is pretty amazing sometimes! Or another option is their website, which is below! Now for the bread and butter of this whole post and really the reason why you are still reading, the actual review of Black Coal Stout. Now we should start with the appearance, and we can use the photo above, cause it is so much easier doing an appearance description when you have something to look at. Now if only I had a laser pointer that I could not operate to show you what I’m talking about… So you will have to use your imagination on this one. As you can tell, I was pretty distinguished drinking this beer, as it was poured into a glass. Whether it was the proper glass for the beer I do not know, but still, glass is a glass. As you can see when poured in the glass, there is a nice brown head, and the body is rich and dark. The can itself, is a grey colour with some yellow on it, which makes it eye appealing. Next would be the sniff test. Like smelling a bouquet of flowers, you drop your nose to the beer and take a deep breath in. Now I will give you a warning, don’t put your nose so close that you inhale beer, cause I assume it will burn. Now the smells that I took in were, mainly a coffee, chocolate and smokey notes. Now this will vary from person to person, depending on their nose. The smokey chocolate and coffee notes go hand in hand with the stout. It was a very pleasant aroma if I do say so myself. For the piece de resistance, taste. What can I say other than it was a very satisfying stout. There were many roasted hues, as well as pronounced coffee flavors. It was I would say a medium bodied beer, with a very smooth creamy texture. There was no sudden punch in the mouth flavors, which was perfect. 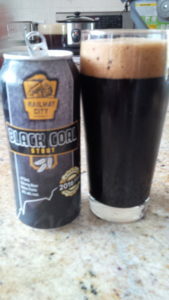 The Black Coal stout just left you very satisfied while drinking it, just a quite enjoyable beer. Overall I would have to say the Black Coal Stout was one of my more favorite Stouts. I’ve been around the block with stouts over the years, thanks in part to the group of friends and family I have. I would recommend anyone who is a purveyor of stouts to go out and track this one down. Would you recommend the beer to a friend? Oh 100%, anyone who fancies a stout should try this one. What day is international Stout Day? November 8th…. yup there is a international stout day. Google is fun sometimes.